Oak Tree and Texas Bluebonnets – A wonderful old oak tree among a field of texas bluebonnets down near Poteet Texas south of San Antonio late in the day as the sun sink lower in the sky. There were a lot of field of wildflowers in this area but most had been overtaken by the poppies. The poppies were introduced accidently about ten year ago we heard and unfortunely they have become invasive and in some place you will not see the wildflowers because the poppies have over taken over the areas. There were a few in this field but it was the best bluebonnets we saw since we were a little late to the party in this area. We like this field a lot and we took a few different shot from here. 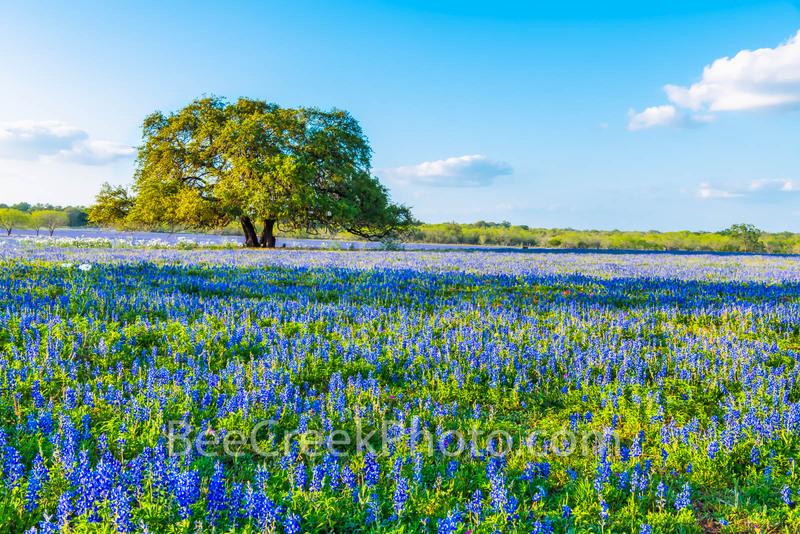 This image was just our beloved texas bluebonnets, an large oak tree, with sime mesquite tree along the fringes of the field with a few poppies mixed in on this ranch in south central area of the country for a nice Texas landscape. The texas bluebonnet is the state flower and begin with a small hard seed and over time the rain, wind will soften the seed so it can germinate in the fall and slowly over time it begins to take root and it bright green leave come out every spring usually from March to the end of April. That when it all begins and the flowers start to put on a spring show. No doubt that what happen in this great field of bluebonnets out south of San Antonio. We were lucky that they were allowed to grow in this field so we could capture this image. We look forward to the yearly show of bluebonnets that come out for such a short time. Texas Bluebonnets with Oak Tree – A wonderful old oak tree among a field of texas bluebonnets down near Poteet Texas south of San Antonio. There were a lot of field of wildflowers in this area but most had been overtaken by the poppies. There were a few in this field but it was the best we saw. All thats here is texas wildflowers bluebonnets, an oak tree, mesquite tree in the distance with a few poppies mixed in on this ranch in south texas. Posted in Photo of the Day and tagged blue, blue bonnets, bluebonnets, field, green, images of texas, landscape, lupine, mesquite trees, oak tree, poppies, Poteet, ranch, San Antonio, south texas, spring, spring landscape, texas, texas landscape, Texas wildflowers, wildflowers on March 29, 2019 March 29, 2019 by Bee Creek Photo. Big Bend Bluebonnets with Mule Ear – One last Big Bend bluebonnets photo from our trip to Big Bend National Park in February this year. This show the bluebonnets with an octillo and shrubs with Mule Ear in the background. The bluebonnets were spectacular and this spot with the wildflowers growing in this desert landscape along side the octillo with the Chiso mountains was a nice landscape find. This is a desert so you expect to find octillos and shrubs cactus but the bluebonnet just gave this barren landscape life. The bluebonnets in Big Bend are a special lupine that can grow several feet tall and thrive in this hostile environment and this year was the first time we have seen them like this, just the right amount of rain in the fall and other conditions that were just right led to the best blooms we have ever seen here in the last ten years we have been coming to the park. Big Bend Bluebonnets with Mule Ear – Big Bend bluebonnets with an octillo and shrubs with Mule Ear in the back ground. The bluebonnets were spectacular and this spot with the wildflowers growing in this desert landscape along side the octillo with the Chiso mountains was a nice landscape find. Posted in Photo of the Day and tagged Big Bend Bluebonnets, big bend national park, chiso bluebonnets, desert, landscape, mountains, Mule Ear, octillo, shrubs, south texas mountains, texas bluebonnets, Texas wildflowers, west texas, west texas mountains, wildflowers on March 15, 2019 March 15, 2019 by Bee Creek Photo. Big Bend Bluebonnets Sunrise – The sunrise was just beginning to push through the clouds over the chiso mountain range near the landmark Cerro Castellan. The sky was getting this heavenly glow from the sun rays as they came through the sky just at the peak of the sun rising up. The Texas bluebonnets were flowing down the slope the valley below in this desert landscape scene. It was a cold morning to be standing and waiting for the sunrise to show and very quite till a coyotes pack began to yelp and howing right below us when a sudden sense of fear over came my other half as there were many yelps, all probably no more than 30 feet below us. Luckily for us they were not interested in us. Whew! This is a wild area and you are likely to run across all kinds of animals here including bear, wild hogs and mountain lions. 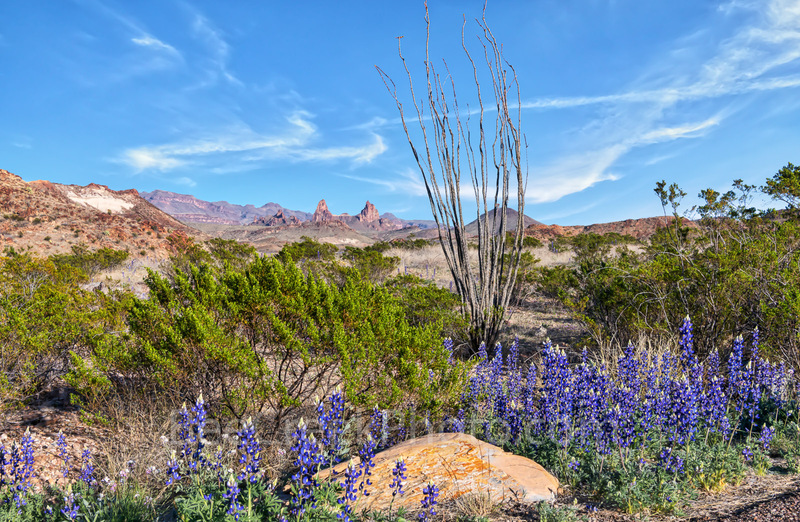 Big Bend National Park was in full bloom with the big bend bluebonnets this year and it was lovely. This was the best year we have seen in our 10 plus years of coming here. The Big Bend bluebonnet or Chisos bluebonnet are the common name of this lupine. It is native to Texas and Chihuahua, where it can be found blooming from January through June. What surprised us were they were all over the hill sides and along the roads in thick patches. We were curious how they got so high up on the mountain sides. In any case it was a wonderful site to see and made us glad we came for this unique show. 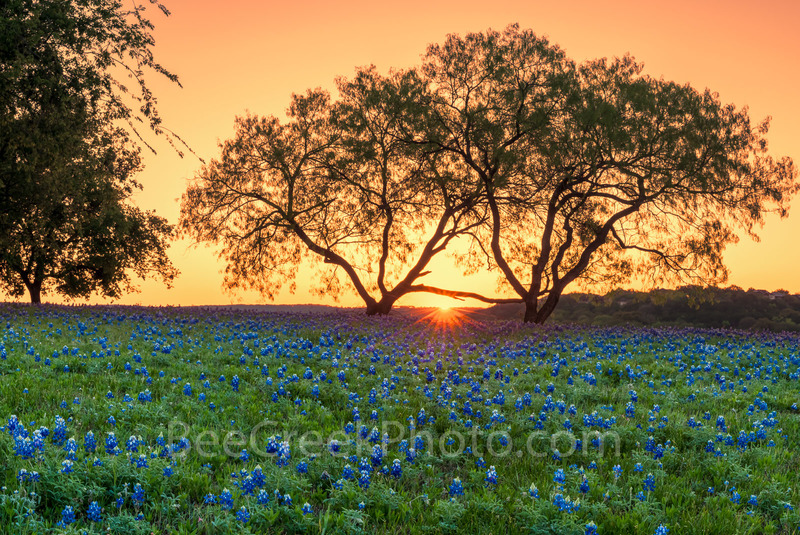 Posted in Photo of the Day and tagged Big Bend Bluebonnets, Big Bend Lupine, big bend national park, bluebonnets, Cerro Castellan, chiso mountains, images of bluebonnets, lupines, sun rays, sunrise, texas, texas bluebonnets, Texas wildflowers, yellow wildflowers on March 8, 2019 by Bee Creek Photo. We were lucky to capture this wonderful sunset over this field of Texas bluebonnets and Indian paintbrush with these hay bales with this great sun set colors of orange, and pinks in the sky in this rural setting wildflower landscape. We came across them accidentally driving the back roads of Texas and we were allowed to come on to the farm property and photograph them for several days. These were the fullest field of bluebonnets we found this year. A great field of flower so of course we came back for a sunrise photo too. You don’t see bluebonnets fields with hay bales like this in our area so this was a unique find in our quest for all images of Texas wildflowers. When it comes to bluebonnets wildflowers Texans including myself go a little nuts over them, people come from all over to see them, take selfies in them, do family portraits, and for many other reason. In any case it is a very popular spring flower and there are people who follow the yearly wildflower reports like a bible just to find the best of the best every year. Now every years is not a bumper crop so it really depends on the weather, amount of rain we receive in the fall and again in the spring. 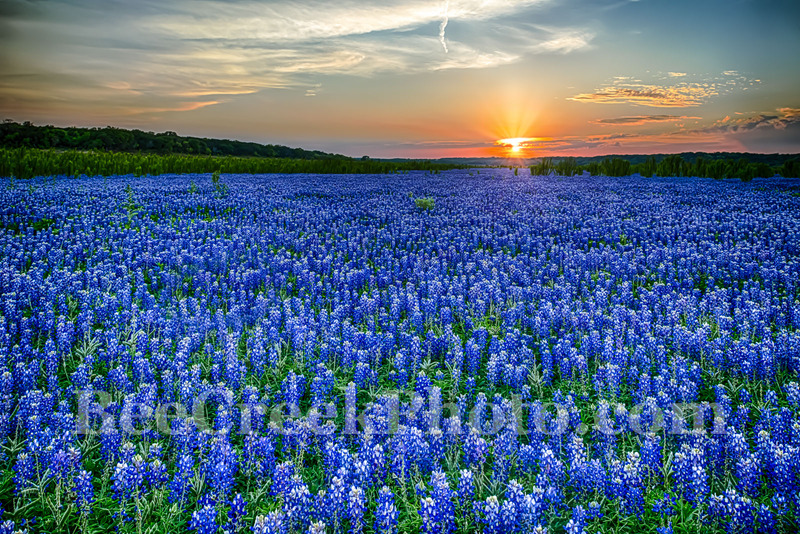 The bluebonnets Lupines or Lupinus Texensis are the state flower of Texas. However, all lupines or considered the state flower in Texas. There are several other types in Texas such as the Lupinus Havardi or Big Bend Bluebonnet, the Lupinus Argenteus or silvery lupine, and several more but the most popular for most people is the ones in this field the Lupinus Texensis. As long as there are bluebonnets in Texas we will continue our quest to capture the best of the best every year. 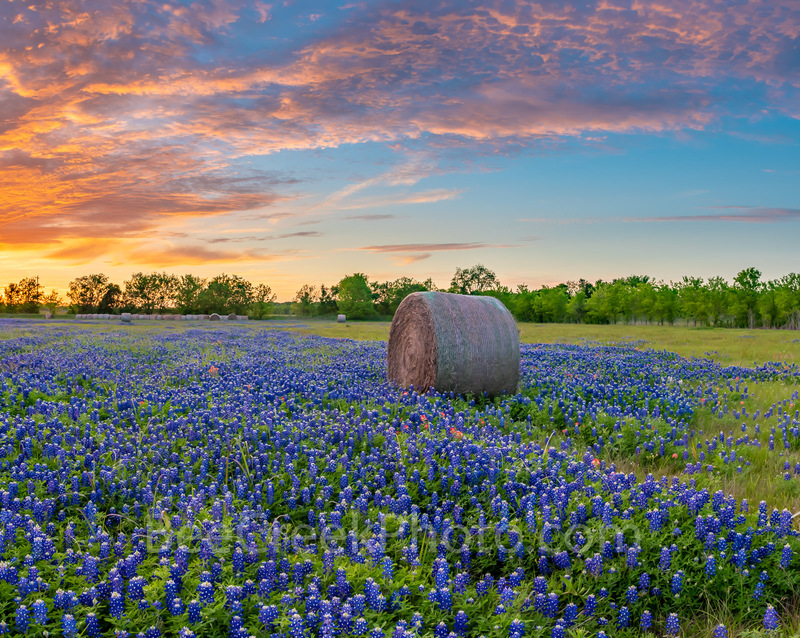 Sunset Over Texas Blue Bonnets with Hay Bales – Texas Landscape Wildflowers – We were lucky to capture this wonderful sunset over this field of Texas bluebonnets and indian paintbrush with these round hay bales with these wonderful sun set colors of orange, and pinks in this rural setting. We came across them accidently and with special permission we were allowed to come in and photograph them for several days. These were the fullest field of bluebonnets we found this year. Posted in Photo of the Day and tagged back roads, colorful sky, farm, field of bluebonnets, hay bales, Haybales, indian paintbrush, landscape, orange, pink, ranch, round hay bales, rural, sky, sunrise, sunset, sunset colors, texas, texas bluebonnets, texas photography, texas sunset, Texas wildflowers, travel pictures, wildflowers on May 3, 2018 January 14, 2019 by Bee Creek Photo. The morning light kissed this field of Texas bluebonnets and hay bales with a pop of red from the sprinkling of indian paintbrush through out the field of wildflowers. I don’t think I had seen such a big field of hay bales with Texas blueblonnets wildflowers in them ever, it was a sight to see and the rancher gave us permission to come on his property and photograph them which was even better. So of course we were there for sunrise and sunset. Can’t get better than this when it comes to Texas wildflowers along the rural backroads of Texas in spring time. The Texas bluebonnet or Lupinus Texensis is the state flower. In 1971 the Texas legislature made all similar species of bluebonnet the state flower. We can also thank Lady Bird Johnson for her help to put wildflowers along the roadside in texas by her push to get the Texas Highway Beautification Act passed in 1965 which put the bluebonnets and other spring flowers on our roads through out the state. 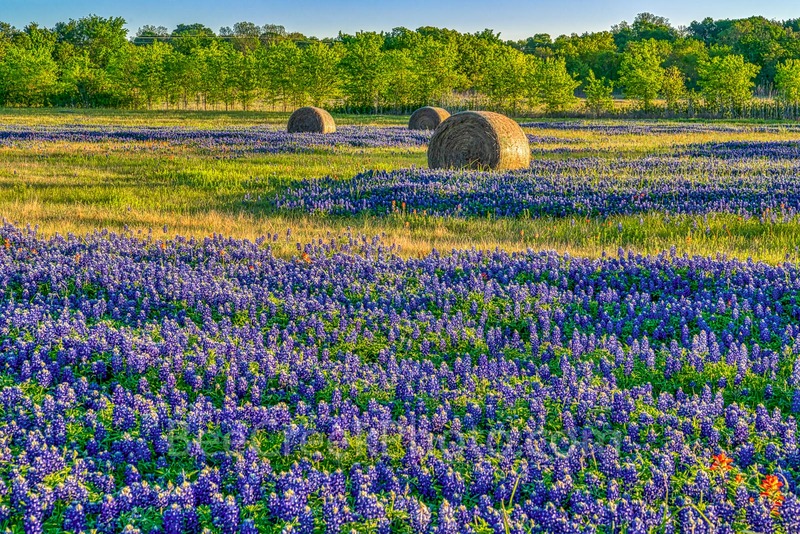 Every spring time Texas comes alive with wildflowers and for April you can see bluebonnets throughout the state. Ever year is different because bluebonnets tend to come out strong every two years, but it still depends on fall and spring rains which determine how good they will be from year to year. However any year with bluebonnet is good one in my view. Texas Bluebonnets and Hay bales Landscape – The morning light kiss this field of hay bales with Texas bluebonnets and a pop of red from the sprinkling of indian paintbrush through out the field of wildflowers. I don’t think I had seen such a big field of haybales with Texas blueblonnets through out this season or any before, it was a sight to see and the farmer gave us special permission to come on his property and photograph them which was even better. 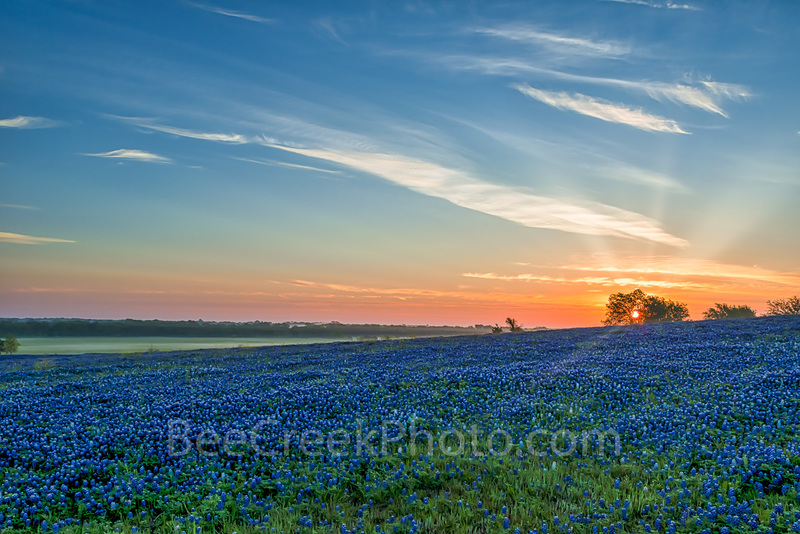 Cant get better than this when it comes to Texas wildflowers with a rural texas setting in spring time. Posted in Photo of the Day and tagged crop, field, field of bluebonnets, field of haybales, hay bales, indian paintbrush, Lady Bird Johnson, lupine, lupinus texensis, rural texas, spring, spring time, texas bluebonnets, texas state flower, Texas wildflowers, wildflowers on April 30, 2018 January 14, 2019 by Bee Creek Photo.